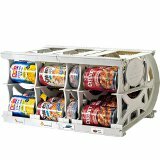 Last week as part of the Monday Shelf Reliance Minuet I assigned a homework assignment, I asked each of you to Look through your shelf reliance info and come up with something cool about our products or company that you didn't know before. E-mail it to me. I love what Elise sent me. Elise lives in Brigham City Utah and has LOTs of people aske her about how THRIVE compares to Honeyville Farms products. She came up with some very interesting info. Thanks for sharing Elise. 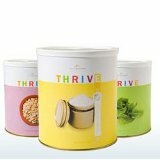 What started out as a price comparison list became an overall quality comparison, and this is what I found out about a few Thrive products vs. Honeyville grain products (A local company here in Box Elder County, Utah). No serving size was listed on line for Honeyville. Thrive usually is ¼ cup. Honeyville is out of a lot of product. There is no date that they expect them to be in stock. Of all Thrive products that come in #10 cans, Honeyville only carries 42 of them. I found it so interesting that you have to refrigerate the meats after opening them, if not you have to use within 1 week! How many people use a #10 can of meat in one week?!! Between the price, the serving size, and the shelf life, Shelf Reliance has a superior product! I compared the meats because they seem to be the priciest with every company. You can compare the rest of the items with the link below.